Consuming enough vitamin C can help you prevent colds and flu. Vitamin C encourages your white blood cells to work more efficiently at destroying germs and bacteria. An 8-ounce serving of mango juice contains two-thirds of your daily recommended vitamin C requirement. Mango juice contains potassium, a mineral that helps your heart, nerves and muscles function properly. Potassium also regulates blood pressure and the balance of fluids in your body. One cup of mango fruit supplies about 325 milligrams of potassium. 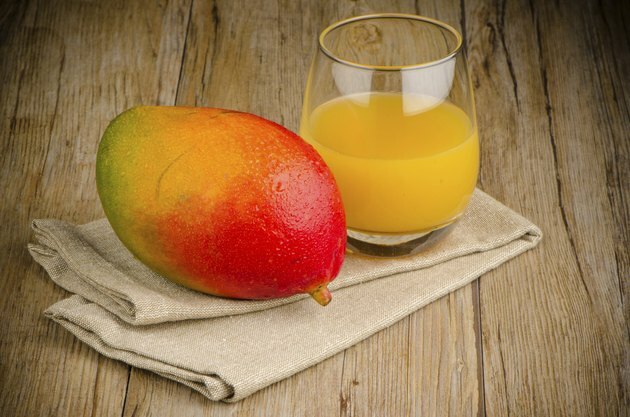 A serving of mango juice, without added water or sugar, contains about 300 milligrams of potassium. National Agricultural Library: Just What is Iron? Can 1-Year-Olds Have Orange Juice?